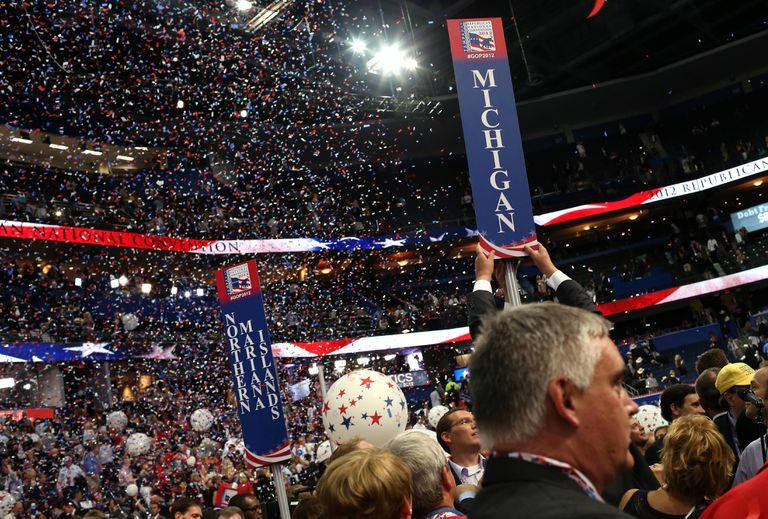 Delegates to the 2012 Republican National Convention in Tampa Bay celebrate as the party nominates former Massachusetts Gov. Mitt Romney for president. Superdelegates are elite, senior members of each major political party, the Republicans and the Democrats, who help determine the presidential nominees every four years. They can, but usually don't, play important roles how presidents are elected in the U.S., particularly in the careful delegate calculus during the primary process. Not all superdelegates are created equal, however. Some have more power than others. The key distinction between superdelegates autonomy, and that is determined by party. In the Democratic Party, superdelegates are allowed to side with any candidate they want at the national conventions. In the Republican Party, superdelegates tend to give their votes to the candidates who won primaries in their home states. So why do superdelegates exist? And why did the system come into being? And how do they work? First Things First: What Are Regular Delegates? Delegates are the people who attend their party's national conventions to decide the presidential nominee. Some states select delegates during a presidential primary and others during caucuses. Some states also have a state convention where national convention delegates are selected. Some delegates represent state congressional districts; some are "at large" and represent the entire state. So Who Are the Superdelegates? Super delegates are the senior-most members of each political party, those who serve at the national level. In the Democratic Party, though, superdelegates also include those who have been elected to high office: governor, and U.S. Senate and House of Representative. Even former presidents Bill Clinton and Jimmy Carter serves as superdelegates for the Democratic Party. The Democratic Party established the superdelegate system partly in response to the nomination of George McGovern in 1972 and Jimmy Carter in 1976. The nominations were unpopular among the party elite because McGovern took only one state and had only 37.5 percent of the popular vote, and Carter was seen as too inexperienced. So the party created superdelegates in 1984 as a way to prevent the future nominations of candidates considered by its elite members to be unelectable. Superdelegates are designed to act as a check on ideologically extreme or inexperienced candidates. They also give power to people who have a vested interested in party policies: elected leaders. Because the primary and caucus voters do not have to be active members of the party, the superdelegate system has been called a safety valve. So What's the Big Deal About Superdelegates? They get a lot of attention in presidential election years, true, particularly if there is the potential for a "brokered" convention - which is unheard of in modern political history. The theory is that if none of the presidential candidates enters their party’s national convention having won enough delegates during the primaries and caucuses to secure the nomination, the superdelegates could step in and decide the race. Critics worry about allowing the party elite to determine the nominee and not the rank-and-file committee members or voters of each state. The use of superdelegates has been described as undemocratic, but the reality is superdelegates have not tipped a primary race in favor of a candidate in modern history. Nonetheless, the Democratic National Committee took steps ahead of the 2020 presidential election to eliminate the potential for superdelegates to decide the nomination. The committee stripped voting power from the party elite and now allows only the delegates elected in primaries and caucuses to choose the presidential nominees unless there's a need for a tie-breaker.